A couple of days ago, Google Drive made news with an update that introduced a new, intuitive Drag & Drop implementation for easier file management. 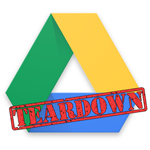 While that appeared to be the only significant change, a look under the hood revealed not only that the Drive team is about to fulfill one of the most often requested features, but it also answered one of the many questions about the fate of Google+ Photos after the split. Disclaimer: Teardowns are necessarily speculative and based on incomplete evidence. It's possible that the guesses made here are totally and completely wrong. Even in the most cut and dried examples, there is always a chance that details may change or plans may be cancelled prior to the launch of a new feature. As with all rumors, nothing is certain until it's officially announced. The dust is still settling after the departure of Vic Gundotra, the man that lead an uncompromising quest to build a social network that would not only exist under the umbrella of Google, but also become an integral part of many products. Shortly after David Besbris stepped up to replace Gundotra, rumors began to circulate that Google planned to split the now popular Photos feature from the social network. Now, Bradley Horowitz is taking charge just under a year after the shakeup, and he's made it clear that Google+ and Photos are now considered separate products. Naturally, this left some questions about what the future held for both groups. Thanks to this release of Google Drive, we can probably answer one of those questions. A series of new strings, and a few modifications, indicate that Drive will take on the responsibility of backing up photos and videos, just like Google+ has been doing for so long. Just to be clear, this only points to a change in the apps, not where anything is stored or how things will be handled on Google's end. <string name="prefs_auto_add_summary_template">"Automatically put Google Photos into a folder in 'My Drive'. Notice, the name used throughout the strings is lacking a '+' symbol. It's still technically premature to assert that Google Photos will be the final name, but at this point, it looks like a done deal. In fact, a couple of old strings have been modified, and another removed, just to eliminate any sign of the social network branding. There are no signs that popular features like Auto-awesome or the other editing tools are going to appear under the Drive umbrella. Instead, it really looks like Drive will simply become responsible for the thing it's designed to do: syncing files – photos and videos, in this case. If I were to guess, I suspect we'll eventually see the Photos app from the Google+ apk split into its own package; and it would probably have tight integration with Drive, much like Docs, Sheets, and Slides. It was one thing when Chromecast support appeared in Slides, tons of people have been asking to be able to run presentations directly from a phone or tablet. However, that demand pales in comparison to the sheer flood of requests from users that desire native streaming for audio and video directly from their Drive storage. This has been such a hot topic, that it has spawned dozens of apps in the Play Store with this specific purpose in mind. A couple of strings in earlier versions of Drive mentioned Cast, but there had never been anything to indicate what types of things could be streamed or that any work had even gone into the feature. That has changed with v2.2. There are still some gaps, but there's now enough to say it looks legit. I won't bother including a huge bundle of strings because almost all of them actually come from a convenience library called CastCompanionLibrary. The library is meant to provide most of the hard parts involved in implementing Google Cast support, including a full-size player screen with a seek bar for audio and video, a mini-controller to allow other content on the screen at the same time, and even support for captions along with configuration screens. While it's possible that the CastCompanionLibrary could have been added as a shortcut to cast other types of content, rather than movies and music, there is new code that proves otherwise. A handful of classes are performing additional actions for setting up the cast and adding metadata like artist, title, and track number for audio, and studio, series title, and season number for videos. This isn't a smoking gun, per se, but it's hard to explain this code any other way.